You are here: Home » Features » Feature: More Power, or More Grip? Feature: More Power, or More Grip? 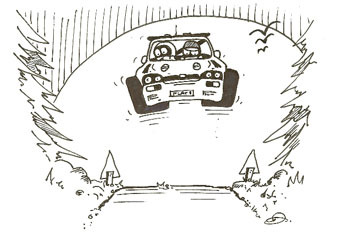 Making your Rally Budget go further …. Here’s a question for you, and think carefully before you answer. If you have a limited budget to spend on your rally car, which would you rather have? More power, or more grip? Since this is mainly a manly sport, the natural gut response from most men will be, more power. But then if you stop and think a wee bit harder, what use is extra power if you don’t have the grip? Fortunately there are some intelligent life forms in our sport, although they can be hard to find at times. Very hard to find. One such outfit is Clone Motor Sport in Mochrum. I was told it was near Newton Stewart . It was nearer Ireland for gawd’s sake! Anyway, despite the ‘help’ I found the place. They’ve got a post code all to themselve s. This is where Fraser Wilson and Steven Broll run their small, but very professional operation and the first thing that struck me on my visit to this remote outpost of civilisation was the sheer dedication of the boys, sorry, young men, who are faced with a huge trip every time they load up for a rally. For instance, it’s 280 miles to this weekend’s Inverness season opener, and then they’ve got to go home again afterwards. That’s quite a prospect for any team, so Fraser and Steven are always looking at ways to extract the best value for the budget they have to spend, and they took a surprising decision prior to the start of last season. Two years ago they purchased a Mitsubishi Lancer EVO6 to replace the Nova in which they had won Class 2 in the national Scottish Rally Championship – and which had itself replaced the original Nova which had come to a sorry end in a Perthshire forest. When the first Lancer arrived it was set up to run on ‘racing fuel’ so they stuck with it for the first few events as a learning curve, but if they thought buying fuel for the Nova was expensive they were in for a financial shock. Coming from two wheel drive to four wheel drive was a new experience for the lads, but even so, they reckoned they could get more out of the Lancer by making more of the potential for grip through its total traction drive system. That meant buying new tyres more often, rather than buying new tyres less frequently and running them till well past their ‘grip-by’ date. Looking at the figures at the end of the 2011 season (9 events) they were spending £3.30 a litre (incl. VAT) on ‘race fuel’ as opposed to £1.30 for BP Ultimate at the local garage. On each event, the car’s consumption averaged out at around 100 litres, so they did the sums! That’s a 200 quid difference per event. At the same time they were buying tyres at around £125 each (incl. VAT), and they reckoned they could buy 4 new tyres at the start of every rally (keeping the best two for spares for the next one) for the 2012 season if they ran pump fuel. Previously they had been buying new tyres only as and when really needed, on average using 2 new tyres per event. But for virtually the same money, they could have 4 new tyres at the start of every event. 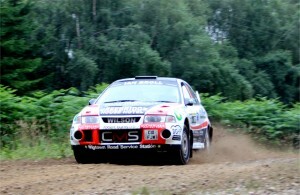 The boys scored their best ever rally result when they finished tenth on last year’s Colin McRae Stages Rally. Yes, they were a more experienced crew by this time and used to the car, but it surely must also have been down to improved grip and more confidence as well? And there’s more. “At the end of the season we had built up a stock of 8 used and 2 well used tyres – and we sold them for a hundred quid to a delighted fellow competitor!” said Fraser. “Luckily, and unusually, the new EVO8 arrived with us already mapped for pump fuel – so that’s the way we’ve kept it,” said Fraser. Clone Motor Sport will therefore run the new car on 102 octane pump fuel again this year, while again keeping a careful eye on costs. So there you have it, the case for pump fuel. And here’s another thing to toss into the considerations. More power will destroy tyres more quickly and put additional strain on driveshafts. The choice is simple – more success, or more expense?